When you look for cheap BJJ rash guards, it’s important to look at all the aspects of the product. BJJ Rash Guards are an important part of Brazilian Jiu Jitsu gear which allows you and your training partners to enjoy training sessions instead of swimming in an uncomfortable pool of sweat. The BJJ rash guard originated from the surfer suit. But as time went by, more and more surfers started training grappling which influenced Brazilian Jiu Jitsu making the rash guard integral to Jiu Jitsu training and culture. BJJ rash guards were developed to both retain your sweat during extremely hard training sessions and maintain just the right body temperature. The one main problem with Jiu Jitsu rash guards can be cost, with some rash guards really hurting your bank account. 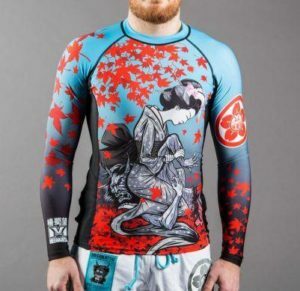 To help you out, I am writing this article to explore the best cheap BJJ rash guards on the market, which means acceptable quality but more money in your pocket. Long-sleeve models are usually not common when looking for cheap BJJ rash guards but we will explore few models in depth. Short-sleeve models are cheaper and are actually better for preventing overheating although long-sleeve rash guards are great for preventing cuts on your arm and generally better for no gi. If you have decided to buy an affordable BJJ rash guards, of course, your primary option will be price/quality ratio. However, we recommend you check material and design, size, hygiene, sleeve length, durability, flexibility, and comfort. While we could easily neglect other parameters, these seven are the basics for a successful choice of cheap BJJ rash guards – you will not spend too much money but you will still be able to enjoy the same quality and performances as more expensive brands. Do you want a cheap BJJ rash guard? You should wonder how long it can last for. Choosing the cheapest model doesn’t mean your criteria will be fulfilled. When it comes to buying the best bang-for-buck BJJ rash guards, we believe you could find good models for even less than 30 dollars, so no need to worry. We would highly recommend picking a combination of polyester and elastane if you need maximum durability and flexibility. For those who want the best rash guard BJJ for easy maintenance, choose polyester and synthetic lycra. Synthetic-lycra material, alongside the combination of polyester and spandex, keeps your ground game as sticky as possible. Spandex also means you will have to use a good washing machine. If you rather have a less grippy material, try the combination of nylon and spandex, polyester and spandex or polyester and elastane – can also result in the best rash guard for BJJ. Make sure you pick sublimated designs – it means that dye should be printed directly on the garment. Good quality cheap BJJ rash guard should offer at least five sizes or more. Also make sure to go through the provided rash guard size charts before ordering. Most brands use different measuring so you should properly measure your body and then order. Look for anti-odor and anti-microbial technology. Make sure the chosen model has both or at least one of them. Short-sleeved models are easier to maintain but the level of protection is worse. However, we recommend it to someone who trains in hot temperatures with lots of humidity. BJJ is a contact sport and you will be dragged on the ground. Your BJJ rash guards should be able to handle all the friction. Spandex and reinforced stitching are the ultimate combinations for maximum durability. You should never feel too much pressure on your shoulders. You need to rotate on the ground with ease. Always take a look whether your model has fabric stitching. You need a BJJ rash guard that will last a long time, prevent you from injuries, and let you enjoy your training sessions. Read our set of details about how to find the best rash guard for BJJ. Considering the 7 important factors mentioned above, I’m sharing my top 5 picks for affordable BJJ Rash Guards. It is the king of low-priced, high-quality BJJ rash guards when it comes to size. It has a low pricing around $25 dollars, and you may choose between six designs and five sizes. You will also get antimicrobial treatment which prevents fungi and bacteria. Ventilated mesh under your arm which disperses heat and you can also wear it during other outdoor sports activity due to its strong UV protection. International Brazilian Jiu-Jitsu Federation (IBJJF) accepts this model for competitions. The flexibility and comfort are good, and this cheap BJJ rash guard will maintain improved blood flow throughout your muscles during high-intense activity. It also prevents you from hurting your elbows and arms and It dries quickly thanks to the unique material it’s made from. The Anthem Athletics Helo-X Rashguard is a great choice. It is thinner, lighter weight model than many other common BJJ rash guards. I also noticed that it retains less odor after a wash which is persistent in some cheap BJJ rash guards. It has even special “side panel insert” to keep your armpit protected from over sweating! Durability, comfort, and flexibility are very good, and it is made of spandex. It is super easy to wash and dry. It also doesn’t leave that much unpleasant odor like other models when training hard. In terms of size and style, it’s available in a dozen of colors and five different sizes. Check Anthem Athletics Helo-X Rashguard size chart to buy the perfect fit for you. 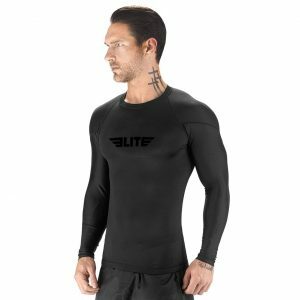 Elite Sports Full Long Sleeve Compression is a cheap BJJ rash guard which draws the best from flexibility, comfort, durability, and price. 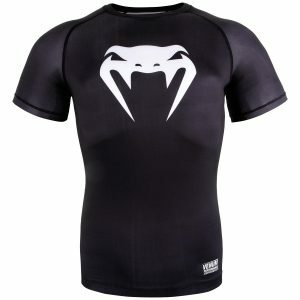 It is my top choice when it comes to affordable BJJ rash guards. It can be used for a variety of sports, has antimicrobial, and antifungal treatment. The rash guard has flatlock stitching, and it is made of spandex and polyester – it won’t peel, crack, fade, or irritate your skin. The pricing is under $20, so you don’t need to invest an arm and a leg. Your blood flow remains constant all the time and IBJJF approves this model. It is also our recommendation for women’s rash guard for BJJ. You can choose between four sizes and six designs, which makes it suitable for both genders. Long sleeves improve the level of protection. It also has anti-slip bands on the waist and sleeves, which is fantastic to keep your ground game sticky. We only recommend you to be warned when you choose your size – read size chart multiple times. It is definitively the best rash guard BJJ when it comes to these parameter – you can choose between five sizes. The color choices can perfectly run with your gi, which is mostly black or white. It is one of the best Brazilian jiu jitsu rash guards in the market because it combines titanium coated fibers with thermoregulation and antibacterial properties, and it fits perfectly, supports circulation, and allows the highest level of performance. International shipping is available, it is approved by the IBJJF, and you can wear it in competition without fear. It has fiber-infused dyed graphics with advanced stitching – great durability, flexibility, and comfort. The price is around 40 dollars which is justifiable. It also ranks well as one of the best Jiu Jitsu rash guards on Amazon. Short sleeves are excellent Jiu Jitsu Rash guards for easy maintenance, while long sleeves are better for maximum protection. Venum Contender 3.0 is probably the best of all Brazilian jiu-jitsu rash guards for users who stick to these three parameters plus durability. Although it has short sleeves, but hygiene has never been easier, and durability is excellent. It protects your body like Kevlar armor! It boosts your performance and allows you to recover faster. You can easily sink this model in water and wash it, and it dries super quickly without any odor! The Venum Contender BJJ Rash Guard even has an internal pocket which can be turned into an additional layer of protection! This model has fiber infused dyed graphics too! It is made of 95% polyester and 5% spandex, and it won’t tear no matter what you do. Anti-odor technology and international shipping are available. You can choose between four designs and six sizes. The price is affordable for most models. However, it won’t keep your ground game super sticky and we recommend you use a short sleeve rash guard for gi training, long sleeve rash guards are better for harder no-gi training. Choosing the best BJJ rash guard doesn’t mean you should stick to the cheapest model. Think about all the performances before you pick your rash guard. We believe the best value model for a cheap price is Elite Sports Full Long Sleeve Compression. 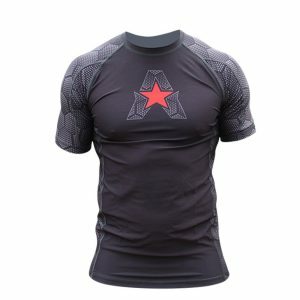 If you need a modern looking rash guard that is sure to turn heads in the gym, stick to Anthem Athletics Helo-X Rashguard. 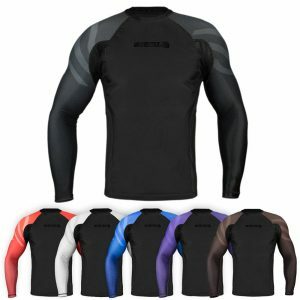 If you enjoy mostly no-gi, try Sanabul Essentials Long Sleeve Rash Guard out. Long sleeves will protect you during rotations and your muscles remain flexible during all types of ground game. 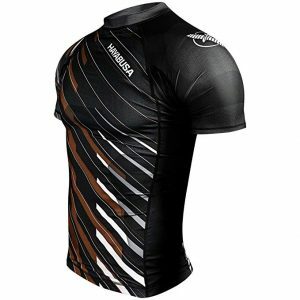 For those who want a premium built and looking Rash Guard, go with Hayabusa Metaru. End of the day, you’re the one who decides so make sure to scour the Amazon and check other models too. Enjoyed reading? Make sure to comment down and share this buying guide with your friends.